Does same-day registration encourage voter participation or open door to fraud? Voters at the Bangor Civic Center take advantage of the last day of early voting in November 2010. AUGUSTA, Maine — A growing trend by states to restrict voters’ rights has brought a backlash in Maine, where a coming “people’s veto” referendum seeks to restore same-day voter registration. On Nov. 8, Maine voters will decide a very straightforward proposal: whether to repeal a new state law that requires voters to register at least two days before an election. Repeal would effectively restore same-day registration, a policy that has been in effect in Maine for nearly four decades. The law allowing people in Maine to register at the polls up to and including Election Day is strongly favored by Democrats, who say it encourages voter participation. But it’s opposed by Republicans who contend that same-day registration opens the door to fraud and abuse. Randy Spencer, a Maine guide who divides his time between rural Grand Lake Stream and Holden, near Bangor, says same-day voting saved him on more than one occasion. When he moved his primary residence to Holden in 2006, “I promptly registered to vote,” Spencer said. But when Election Day rolled around, his name didn’t appear on the registered voters list, so he was allowed to re-register in the town office. In the next November election, the same thing happened. While the new law includes a provision that could allow people like Spencer to vote by giving them a ballot and verifying their legal status within three days of the election, supporters of same-day registration say it also helps people who work multiple jobs and lack time to register. Opponents, however, are rankled by students who enter colleges as nonresidents but register to vote in Maine at the last minute before elections. In Maine and other states, Republican opponents of same-day registrations have said enough. Among the seven other states that have allowed same-day registration, bills were introduced in two this year — Montana and New Hampshire — to repeal that provision. In New Hampshire, the bill failed to pass in the House. Montana’s bill was vetoed by the governor, according to the National Conference of State Legislatures. At least 13 states introduced GOP-backed bills this year to end Election Day voter registration, limit voter registration efforts or reduce other registration opportunities. In addition, nine states considered bills to reduce their early voting periods, and among them, bills in Florida, Georgia, Tennessee, Ohio and West Virginia have been enacted, according to the nonpartisan public policy organization Brennan Center for Justice at New York University. In Ohio, a new GOP-backed election law that shortens the early voting period for the presidential election swing state was placed on temporary hold after Democratic opponents submitted petitions to get a repeal question on 2012 ballots. The Ohio Democrats’ action was strikingly similar to what had happened months earlier in Maine, where a petition effort led to this fall’s referendum to get rid of the law requiring registration at least two days before the election. Thirty-four states, including Maine, considered bills to require photo identifications to vote. Maine’s bill was held over, so the State House debate will resume in 2012. 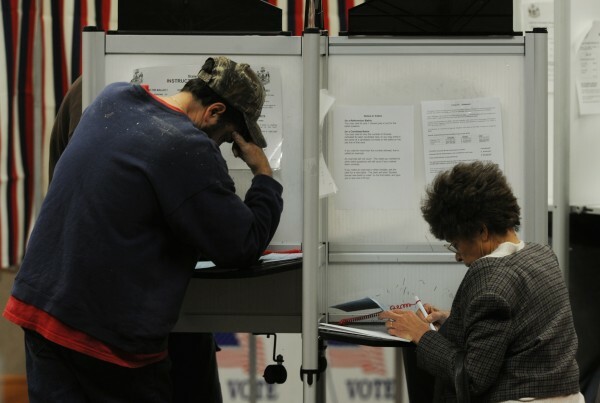 A report last week by the Brennan Center says the newly enacted restrictions could make it harder in 2012 for more than 5 million eligible voters to cast ballots across the country. The restrictions in Maine could be around 60,000, the approximate number of people who registered on Election Day four years ago, the center says. Michael Waldman, executive director of the Brennan Center, called the trend “the most significant cutback in voting rights in decades” and said it could cause more voters to lose their opportunity to cast ballots than the margin of victory in two out of the past three presidential elections. “It’s been a much bigger priority than it’s been in the past,” Weiser said. She said there’s been a clear partisan divide on the issue, with Republicans pushing for the changes. Ironically, when Maine became the first state to adopt same-day registration in 1973, the Republicans controlled both houses of the Legislature and the proposal passed unanimously, the Brennan Center noted. The rethinking of a voting-access policy in Maine gained traction after the Republican Party took control of the Legislature and governor’s office in last year’s elections. After vigorous, partisan debate, lawmakers this spring passed a law requiring those who want sh to vote and who are eligible to register at least two business days before Election Day — or until 5 p.m. the Thursday before an election. The public debate has pitted the GOP establishment against a coalition of Democratic-leaning advocates for organized labor, consumer and public health causes, the disabled and the state’s homeless. The campaign rhetoric has been sharpened by GOP claims of nonresident students abusing the system and voting twice — charges that have gone essentially unsubstantiated. While an investigation by his office failed to flush out any fraud or illegalities among the students, Maine Secretary of State Charlie Summers said he saw enough evidence to convince him that municipal clerks need more time to review voter registrations, and the 48-hour requirement “is a very, very reasonable, moderate step.” He noted that 41 other states require longer registration periods before election. Democrats and other defenders of same-day registration have sought to link the new wave of voter-registration rollbacks with the American Legislative Exchange Council, a conservative Washington-based nonprofit that espouses conservative policies in state legislatures. Democrats and the Protect Maine Votes Coalition have also identified prominent Republicans who registered on Election Days, promoting charges of hypocrisy that reverberated briefly during the campaign. Maine Republican State Chairman Charles Webster dismisses suggestions of an organized GOP assault on the states’ voting laws, and said Maine acted on its own when it passed the two-day registration law. For three decades, Republicans in Maine have tried every session to repeal same-day registration, and it has been rejected on a party line vote each session, Webster said. Now the Republicans have a majority in the state, as well as other states, and they’re using their power to make changes. Webster defends the two-day requirement as “just a common-sense idea” that gives elections a hedge against manipulation and abuse. He said that among the “mayhem and chaos” of Election Days, voting registrars become preoccupied and are more likely to allow “a small measure of mistakes” in registrations. But even that small measure of errors can lead to recounts, overturn elections and decide control of legislatures, Webster said. While Webster says one mistake is too many, same-day supporters say one eligible voter turned away is too many. And they cite study after study that refutes the voter-fraud claims of their opponents.